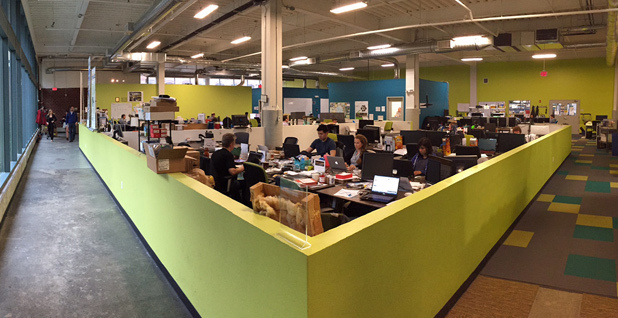 More than 40 companies, many involved with energy, maintain desk space at Greentown Labs in Boston. Photo by David Ferris. BOSTON -- WrightGrid is a startup that makes cellphone charging stations powered by solar. Its workshop measures 300 square feet, about the size of a small studio apartment. When it needs a rivet gun or a part made on a 3-D printer, it turns to other startups located in the same warehouse. Autonomous Marine Systems (AMS) is developing an oceangoing robot catamaran, or "datamaran." Some of its best fundraising advice comes from two neighbors, Dynamo Micropower and Altaeros Energies. Its electronics and metal parts are fabricated at five different factories, from suburban Washington, D.C., to Detroit. Welcome to the new model for inventing and refining hardware. WrightGrid, AMS and about 40 other companies reside at Greentown Labs, an incubator in metropolitan Boston that hosts fledgling hardware companies trying to get to market. It is one of a handful of incubators and accelerators that are offering a cheap, hybrid path toward something that America supposedly forgot how to do -- invent amazing physical objects. "If you have a space like this, the chance that you can turn that idea into something great is 10x than if you tried to do it in your garage," said T.J. Edwards, the 30-year-old CEO of AMS. Greentown is made up of two main parts. One is 10,000 square feet of office space, where executives, salespeople and software engineers do their thing. Alongside it is another 20,000 square feet of "lab" space with high ceilings, where the boundaries between projects are demarcated in neon-green tape and where engineers can be messy and noisy. To qualify to enter, a company must make hardware; no app developers need apply. Most are merging physical objects with some combination of robotics, advanced electronics, global-positioning systems, renewable energy or data to perform tasks that no object has ever done. No two products are the same. Getting from idea to prototype to the first sale is much longer, riskier and more expensive than it would be for a software company. But the companies are a lot smaller than yesterday's hardware labs. To cut costs, they rely heavily on contractors, corporate partners and peers. The company consists of a few desks, a few hundred square feet of workshop and a squad of brainy employees who tie it all together. "You're fighting against an engineering problem. You're not just trying to program something," said Emily Reichert, the CEO of Greentown. "You're trying to machine something, right, and there's lots of skill and expertise that it's important to have shared among a larger community." Nowhere is that fight more difficult than in energy, one of the most conservative and risk-averse sectors in the economy. Most of Greentown's tenants are tied in some way to energy, from Altaeros Energies, a maker of airborne wind turbines, to Dynamo Micropower, a builder of portable microturbines, to Appollo Wind, which is trying to make air conditioning more efficient, to Loci Controls, which controls methane-gas collection from landfills. Greentown calls itself the largest clean-tech incubator in the country, though some of its products, like a detector of dirty bombs or a maker of 3-D printers, fall outside the usual definition of that term. All face an uphill battle for funds. Clean tech -- and especially clean-tech hardware -- is still a dirty word to many investors, who remember the high hopes and bankruptcies that accompanied the downturn of 2009 and 2010. Companies using collaborative spaces to build hardware is an idea as old as Thomas Edison's Menlo Park laboratory. After cranking out wave after wave of great inventions through the mid-20th century, though, the United States' big corporations have produced fewer hits in recent decades. Most manufacturing moved abroad, and the torrid pace of software absorbed R&D dollars at the expense of hardware. Now, a millennial generation is arriving with little money but a desire to collaborate, born of the always-connected Internet. 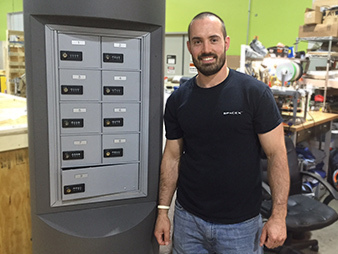 Ryan Wright, founder of WrightGrid, stands in the Greentown warehouse. By him is an unfinished version of his company's mobile-device charging station, which is powered by solar panels. Photo by David Ferris. Most of the new hardware workspaces provide office space and workshop space, along with business advice, in exchange for a piece of the company. One is Bolt, a hardware manufacturing space in Boston that is the former home of some Greentown members. A leading hub is the San Francisco Bay Area, home to Lemnos Labs, Highway 1 and Lab IX, an outgrowth of Flextronics, one of the giants of contract manufacturing. Another, older strain is umbrella firms that nurture on their own projects while also doing contract work for other companies, such as DEKA Research in New Hampshire, the innovation hub created by Dean Kamen, best known as the inventor of the Segway, and other outfits like SRI International in Arlington, Va., as well as Applied Minds in Southern California. Greentown is unusual in that it doesn't take a stake in its tenants; it just charges rent. Most hardware spaces lead their recruits through a supercharged accelerator program to refine their business skills. Greentown, by contrast, picks and chooses young firms that have already proved their mettle by winning prizes, raising funds or surviving the crucible of others' accelerators. In the 3,000-square-foot "event space," hardly a day passes when a free lunch isn't put on by an organization offering some sort of advice or training. Every week, CEOs attend a roundtable to talk fundraising strategy and explore issues that are too sensitive to discuss in front of their employees. Greentown has built out a long roster of corporate partners such as Saint-Gobain SA, the French building-materials company, which has built an experimental pod where Greentown's building startups can test their equipment. Others, such as Autodesk and Solidworks, give tenants free access to their prototyping software, while big energy companies such as Shell, EnerNOC and National Grid contribute upward of $50,000 a year to the incubator’s operations and offer regular "office hours" with member companies to dispense advice. All want to cultivate relationships with the next wave of young hardware companies. What's happening at these hardware incubators and accelerators is very much like what happened at software incubators since the 1980s, when shrinking microprocessors and leaps in computer programming made a new wave of businesses possible, said Steve Blank, a serial entrepreneur and instructor of entrepreneurship. The difference this time is in the tools. A constellation of products are now cheap and easily available that endow machines with new abilities -- everything from drones to 3-D printers to web services that make data crunching cheap, to the gyroscopes that exist in any smartphone, Blank said. Another, he said, is the rise of on-demand, small-batch manufacturing, which makes it far easier to develop prototypes quickly. "We now have a way to manufacture things incredibly cheaply by a factor of 100, if not 1,000, and that's China Inc.," Blank said. Most Greentown companies interviewed for this story do most of their contract manufacturing, at least for now, in the United States. But even with cheap and powerful tools, bringing new hardware to the market is extraordinarily hard, for both the company and its incubator. "The reason that this seems new is because it requires so much expertise and talent on the part of the people who are helping the companies incubate," said Bryan Mattimore, a corporate creativity consultant. "This isn't just, 'give them office space and add some business consulting advice.' These guys need to be very sophisticated in their knowledge of the technology and business, and help these companies invent and solve problems appropriately." The companies at Greentown are small even as they take on projects that encompass vast swaths of expertise. Many require not only experienced mechanical and electrical engineers, but software engineers who can mesh data with machines while also creating apps that give the customers some degree of control. They are more open and fluid than America's prior wave of industrial innovation. Those older corporate and government labs, often designed in the era of the Cold War, are frequently hierarchical, secretive and rarely mix researchers across different disciplines. "We located the national labs for the most part a long way from the population centers because we wanted some level of secrecy, and we built this huge infrastructure that is not really relevant to how we do applied engineering and applied science projects today," said Saul Griffith, the founder of Otherlab, a San Francisco hardware innovation space. "Honestly," he added, "those places look like slow and expensive ways to do research." Occupying one tip of the L-shaped warehouse floor is Grove Labs, a company devising a "farming appliance" for homes. It is an aquaponics system -- incorporating both fish and vegetables -- so its workshop is a humid room of bubbling fish tanks and varieties of lettuce and basil. Leave this biological zone and one passes the far more sterile stall of Voxel8, a company that is building a 3-D printer that can assemble electronics from scratch. Walk the other way, through the double doors to the office space, and one finds a dispenser for Bevi, a startup that wants to shake up the bottling industry by mixing beverages in the dispenser itself. To top off the science-fair feel, a few stalls up from Voxel8, an electrical engineer solders a circuit board together with the help of a microscope. His company, Silverside Detectors Inc., is building a sensor for the Department of Defense that can cheaply detect nuclear devices. Greentown has a waiting list of companies that want to join, and its biggest problem is finding room for the companies it already has as they grow, Reichert said. A second location may come online soon. Many of the startup founders, and many of their employees, come from the deep pools of intellect at Boston's universities, such as the Massachusetts Institute of Technology, Harvard, Northeastern and Tufts. WrightGrid's work area is near the center of the lab floor. The founder, Ryan Wright, gave a tour of his solar-powered charging station, while his chief engineer, Daniel Vanier, assembled a circuit board. "If we were in my basement, or in some factory setting, maybe we got great rates, but we're the only one in there," Wright said. He was interrupted by a loud whine coming from a nearby tool shop surrounded by a chain-link fence. The cage held some of Greentown's shared machining tools -- a drill press, a lathe, a bandsaw -- and someone was busily grinding down a piece of plastic. "If we're locked away somewhere, no one's going to see us," he concluded. Being seen is one of the best things about being at Greentown, Wright and others said. Candidates for Massachusetts governor have trooped through, as have investor groups and reporters. The person passing you in the walkway might be a guy in a hardhat with a ladder, or a Chinese businessman in a tie. At Greentown, "You feel like you're part of a community already," said Nicole Homier, the vice president of product for Understory, a company that is fashioning a product for insurers: a sensor that detects hail. "When you're working at a tiny startup, it's just so isolated," she said. "Now you're with people who are all experiencing similar things, so there's people to talk to about the issues you're facing." Shell is buying clean-tech companies. What's going on?